I am authorized to issue a California Confidential Marriage License through Los Angeles County Recorder or Clerk’s Office. This type of marriage license is unique in that your wedding can be sealed from public view so when you elope your secret is really secret. 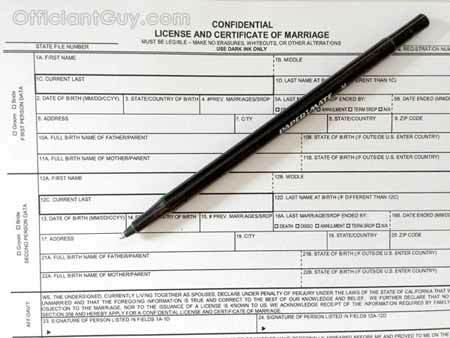 Many people are confused about difference between a confidential marriage license and a public marriage license. While your marriage will be the same in all legal respects with each type of license, in my opinion, the confidential marriage license is superior to the public marriage license in a number of ways. The reason it is called a confidential marriage license is that once it is filed with the County Clerk’s Office the marriage certificate does not become available to any third parties. This protects you from identity theft, telemarketers, scammers, the media and anyone who should not know the details of your life. Public marriage licenses allow your personal information to be seen by anyone. Also, no witnesses need be present so it can be a secret wedding. And since I am obliged, by law, to keep the confidentiality of your marriage from anyone else, I would be the only person who would know. If I issue your confidential marriage license to you and your fiance, you will not have to spend unnecessary time, sometimes hours, standing in lines at the County Clerk’s office. Click on California Confidential Marriage Licenses Requirements to see if you qualify for this special marriage license.